They can point with pride to some big economic achievements, above all the successful rescue of the auto industry, which is responsible for a large part of whatever job growth we are managing to get. But they’re not going to be able to sell a narrative of overall economic success. Their best bet, surely, is to do a Harry Truman, to run against the “do-nothing” Republican Congress that has, in reality, blocked proposals — for tax cuts as well as more spending — that would have made 2012 a much better year than it’s turning out to be. As a political matter, however, it’s not likely that pointing this out will do Obama any good. Harry Truman and the do-nothing Congress may be the stuff of legend, but guess what? That probably had little to do with Truman’s victory. 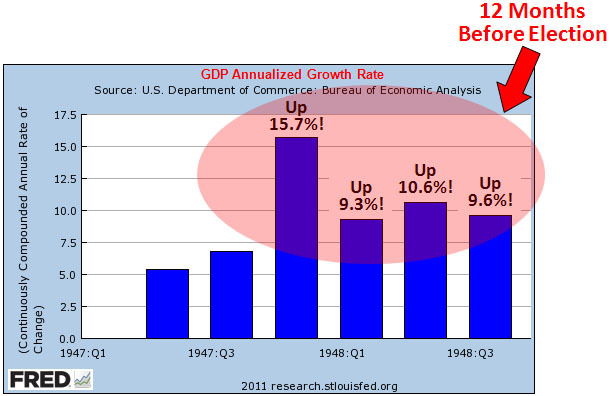 Truman won because the economy was on a tear for the entire year before the 1948 election: Nominal GDP skyrocketed (chart below) and real GDP was growing at a pretty healthy clip too. Economically speaking, it was a terrific peacetime performance. Obama doesn’t have this. He’s got about 3% nominal growth and 2% real growth. There might be justice in blaming this on Republicans, but probably not electoral victory.